American yard Westport Yachts made a big impression at this year’s Fort Lauderdale International Boat Show with the debut of the first model in its brand new Westport 125 series. Naturally, Boat International was one of the first on board this 38 metre superyacht to take a look around and explore her refined interiors. 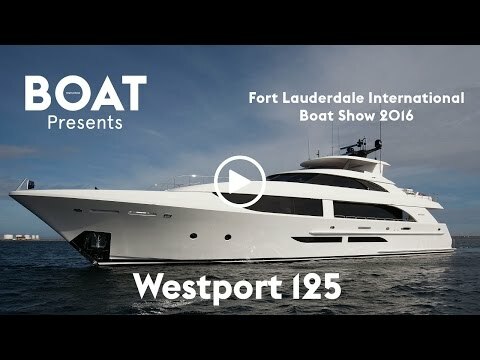 In this video Daryl Wakefield, President of Westport Yachts, offers his insight on the key features of the new Westport 125. “It really hits on all of the things that Westport is known for: great speed, nice comfort — all the way around, I just think it’s the natural next generation,” he said. Wakefield added that the Westport 125 is the first model from the Washington-based yard to feature a gyroscopic stabilisation system. Other key features include the main-deck owner’s cabin and the country-kitchen style galley. The Westport 125 follows on from the hugely successfully Westport 112 series, which has spawned 60 hulls so far. Accommodation on board is for ten guests split across five cabins, while the crew quarters allows for a staff of up to five people. Power comes from a pair of 2,600hp MTU 16V 2000 M96L diesel engines, which can deliver a top speed of 25 knots. When trimmed back to its cruising speed of 12 knots, the Westport 125 boasts a maximum range of 2,500 nautical miles, thanks to a total fuel capacity of 26,744 litres. Other projects currently under development at the American yard include the second and third hull in the Westport 125 series, both of which are due to hit the water before the end of the year.